With 15% glycolic acid and 0.5% retinol, Alpha-H's Beauty Sleep Power Peel is a regenerative powerhouse – kick-starting cells while you sleep to promote the production of collagen, elastin and moisture-retaining glycosaminoglycans. Refining, firming, plumping and radiance-boosting, this is beneficial for virtually all complexions – whether they’re starting to betray their age, or are susceptible to blemishes and breakouts. This unbeatable duo ensures that you’ll never be without this night-time treat for your complexion. 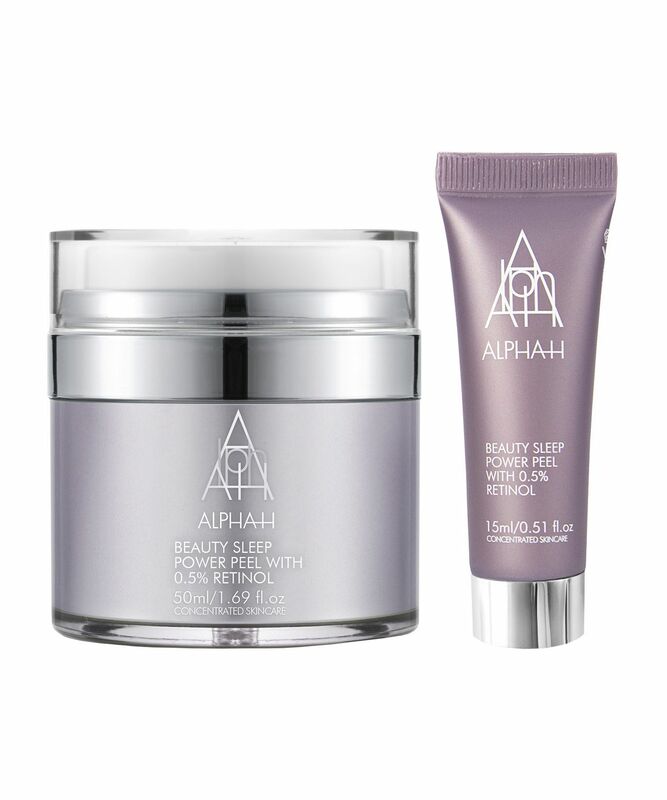 Formulated to exfoliate, rejuvenate and repair while you’re resting, Alpha-H’s Beauty Sleep Power Peel Home & Away Duo is a potent, age-reversing and skin-clarifying cocktail of actives – including a high concentration of glycolic acid to gently dissolve dulling dead cells, and retinol to stimulate the manufacture of essential building blocks (like elastin and collagen, both responsible for your complexion’s youthful ‘bounce’, ‘stretch’ and density), so you wake up to plumped and glowing skin. By eliminating pore-clogging debris, the clarifies pores to prevent blemishes, while by encouraging regeneration, this gradually lessens visibility of scars. Algae-derived chronody works to enhance vitality and trigger cell metabolism, while ‘Axolight’ – derived from wheat bran – inhibits melanogenesis to delay the development of dark spots and exhibit a skin-brightening effect. It’s an all-round, one-stop skin-perfecting shop! Use two evenings a week. Apply to clean, dry skin using upward, circular motions over the face, neck and décolleté, avoiding the eye area (it can also be applied on top of serum). There is no need to follow with a night cream.